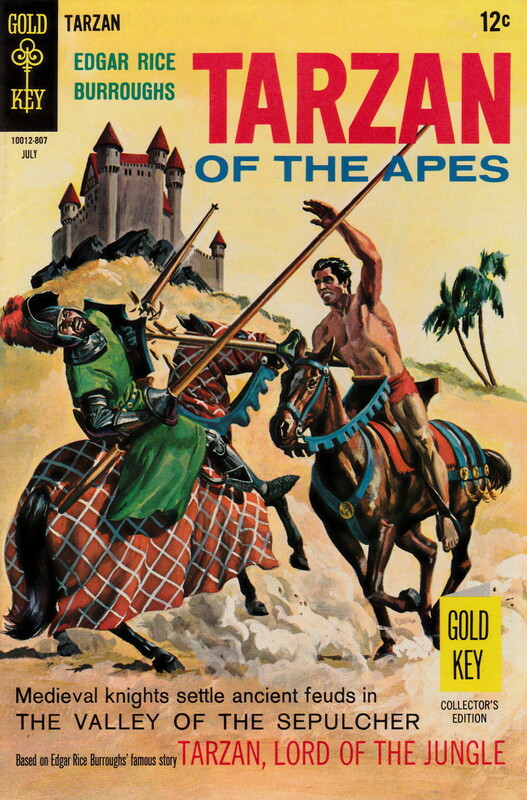 Except for a couple of children's books about the Tarzan Twins (that Griffin covers in a separate section), Burroughs took a four-year break from Tarzan stories after Tarzan and the Ant-Men. 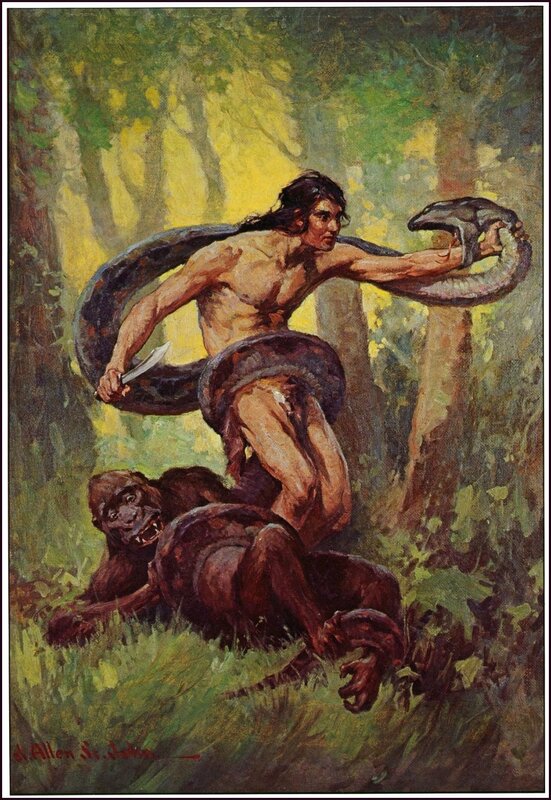 When he came back, he jettisoned most of Tarzan's supporting cast in favor of stories in which Tarzan wanders the jungles, helping explorers and discovering new lands. The first of these is Tarzan, Lord of the Jungle, in which the ape man and an American photographer discover a hidden valley inhabited by medieval knights. 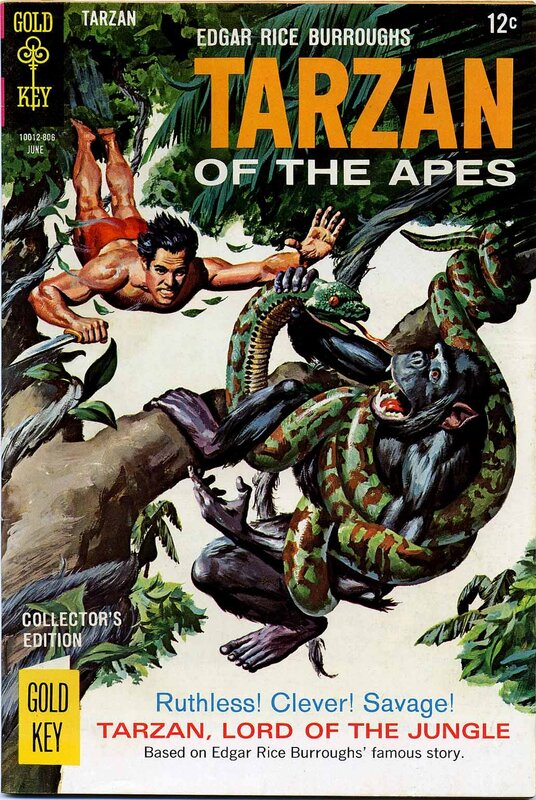 Curiously, most of the cover art for various editions of book features Tarzan rescuing a gorilla from a giant snake. That's cool and all, but I don't understand why they're hiding the lances and plate mail that make this novel distinctive. Burroughs got some great feedback from readers about his new approach and that pleased him; not only because people liked it, but because he could write this kind of story a lot more quickly and easily than the more complicated plots he'd been doing up to then. Griffin includes a supplemental chapter after the one on Lord of the Jungle, but it really ties in with the next book instead of this one, so I'll cover it next week. I love all of those covers. Please tell me there's not even a scene with a snake in the book and it makes it that much more awesome. Sadly(? ), the scene does actually appear in the book. Of course it does. It's too awesome an idea NOT to.